When travelling the east coast there are two trips that everyone – really, everyone – will be doing. 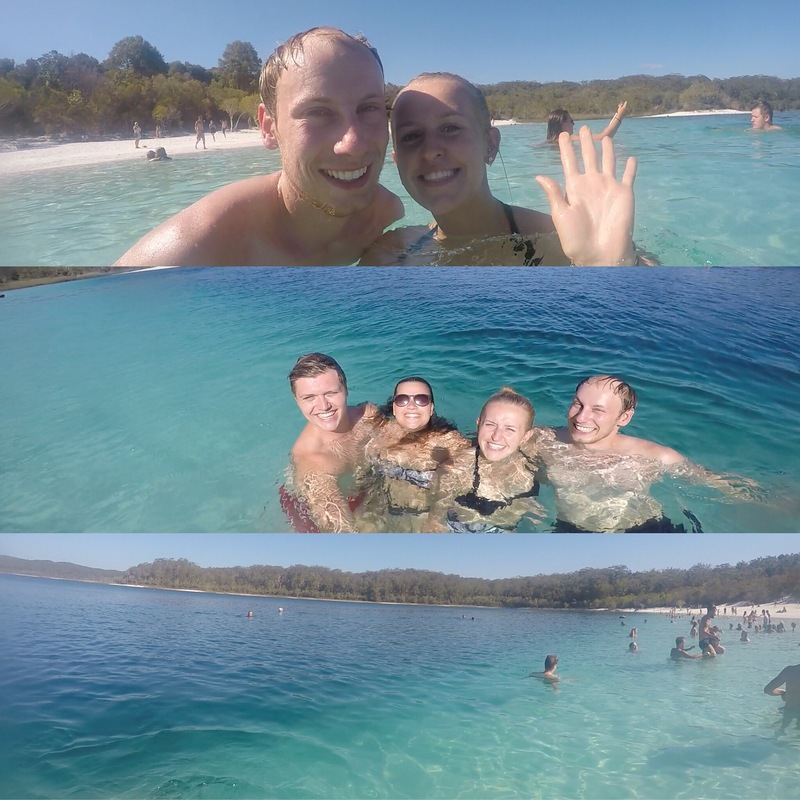 Those trips are Whitsundays and Fraser Island. 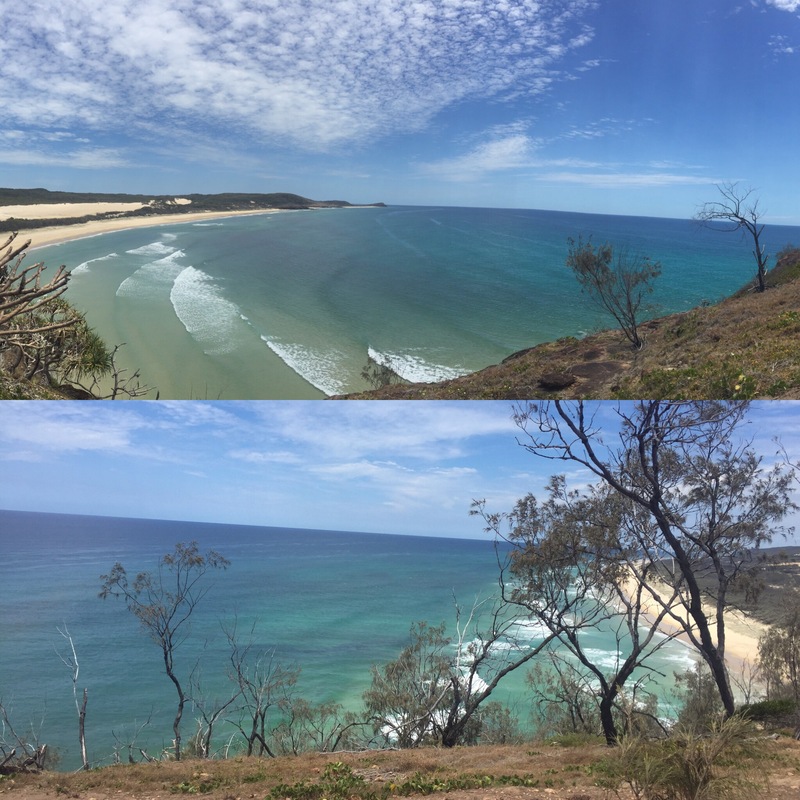 Depending on whether you’re travelling north towards Cairns or south towards Sydney will depend on which you do first – for us, it was Fraser Island. 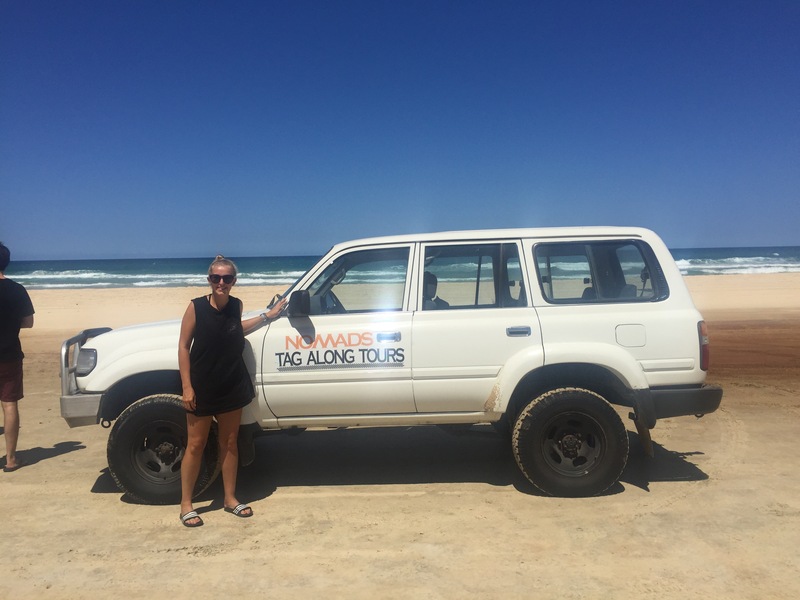 There are a lot of companies that do trips to Fraser Island and different variations on what you can do from day trips, 2 days and 1 night, 3 days and 2 nights, doing a tag along tour where you drive 4×4 or a coach tour. 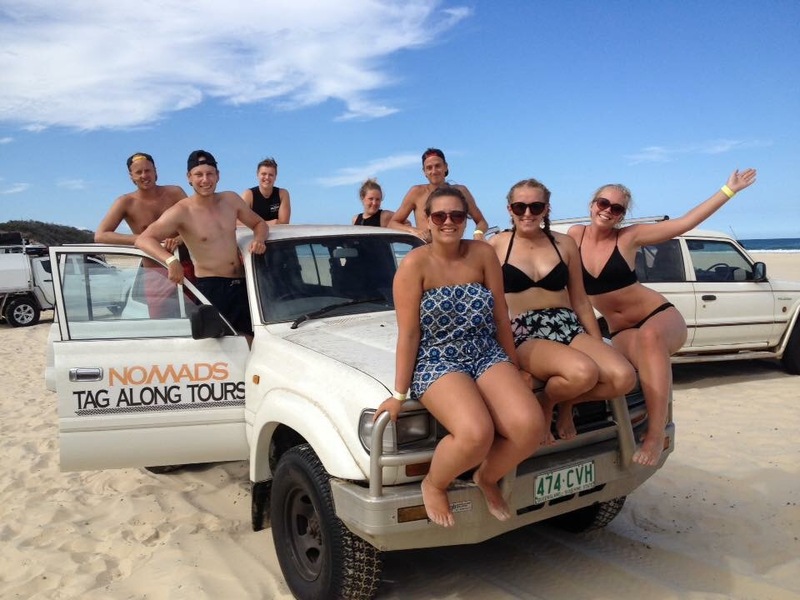 We chose a 3 day, 2 night tag along 4×4 tour with a company called Nomads who also have a lot of hostels around Australia. 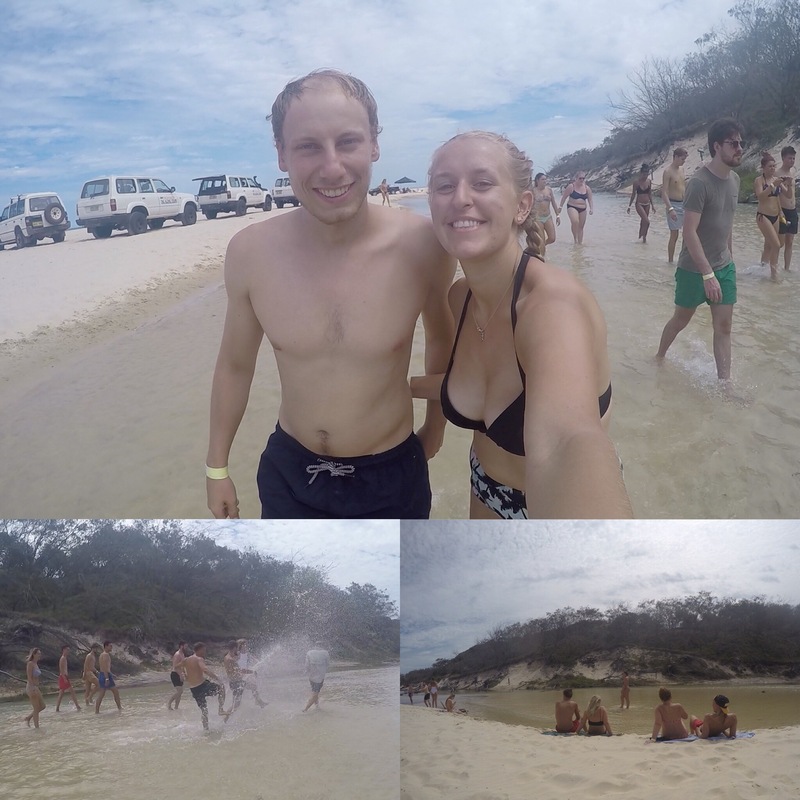 Fraser Island is roughly 44 square kilometres and is the largest sand island in the world so we still wouldn’t see all of it even with spending 3 days there. 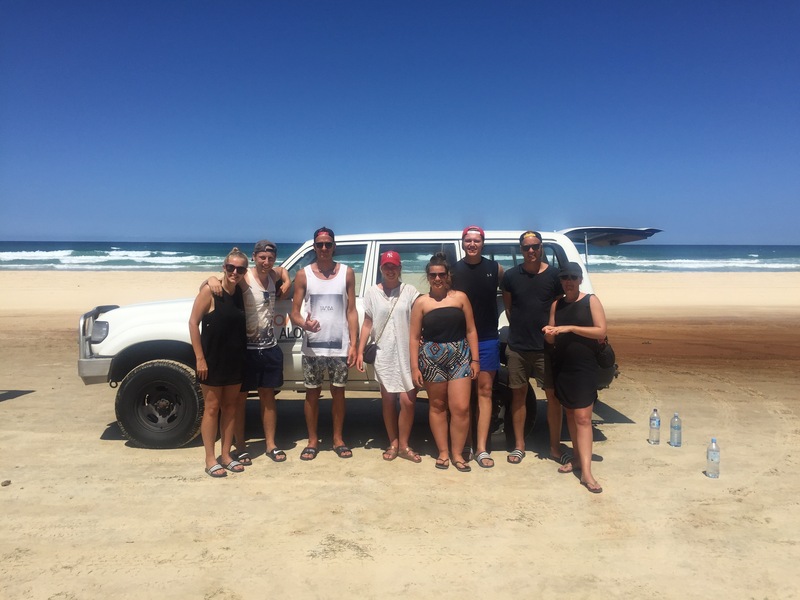 Our tour went from Noosa on the 18th February 2017 and left at 7am that morning to get us to Rainbow Beach to pick up our cars and get a barge across to Fraser Island. The first order of business was to allocate who was in what car. We were split into those who wanted to/ were allowed to drive (you had to be 21 and over with license that was at least 2 years old so not everyone who could drive was able to). 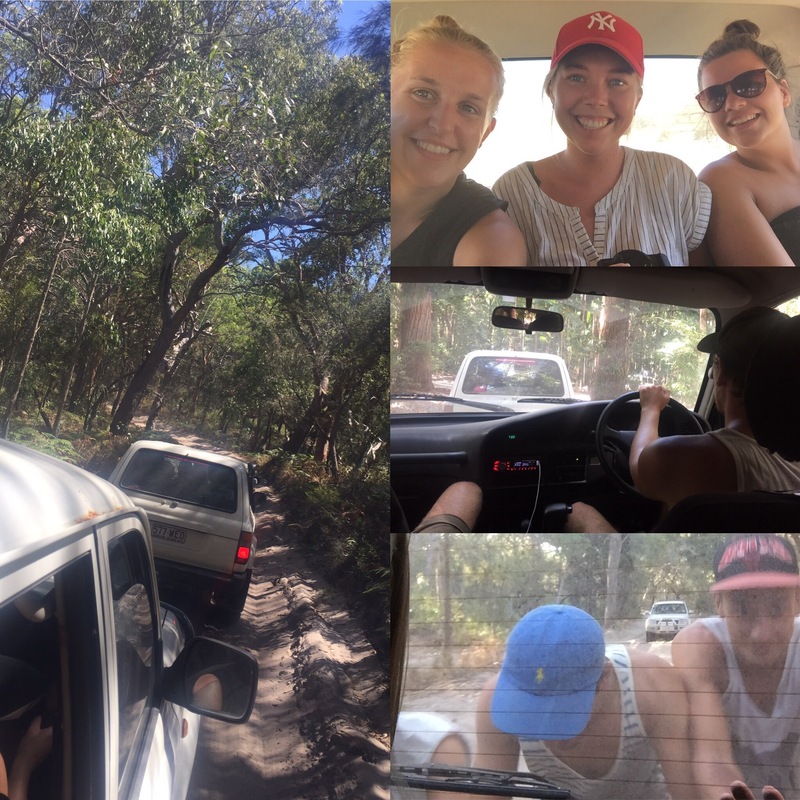 We were put into a car with 2 Swedish couples that were travelling together (3 of them were driving) called John, Carrin, Annie and Rasmus and then Bronte and George who we had met at the briefing the day before who weren’t able to drive. 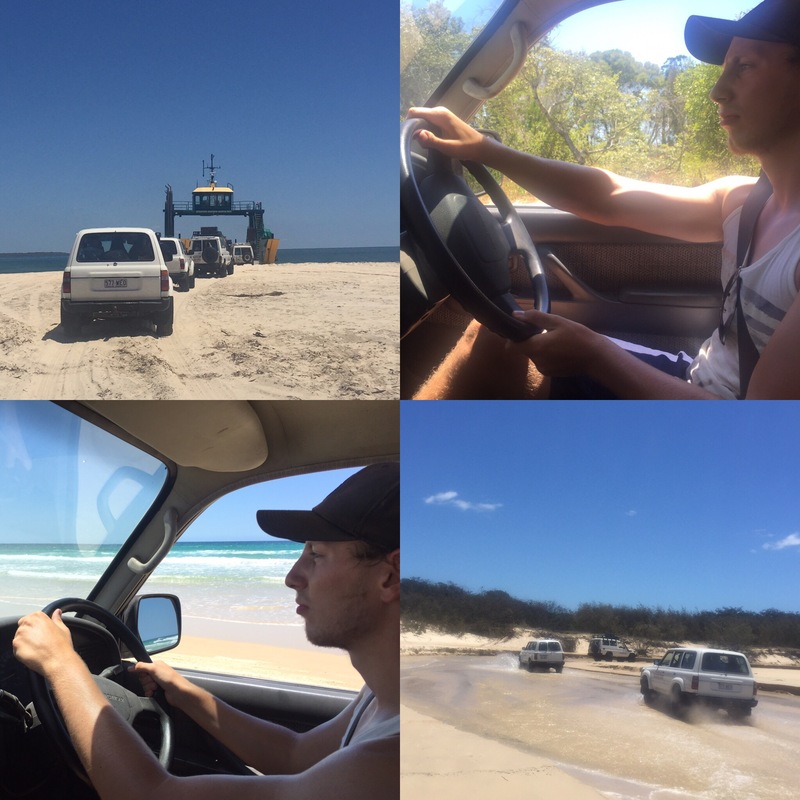 Niall was the first person to drive and got us from Rainbow Beach over to Fraser Island. When we were on the barge we saw loads of dolphins swimming which got us all really excited for the few days ahead! 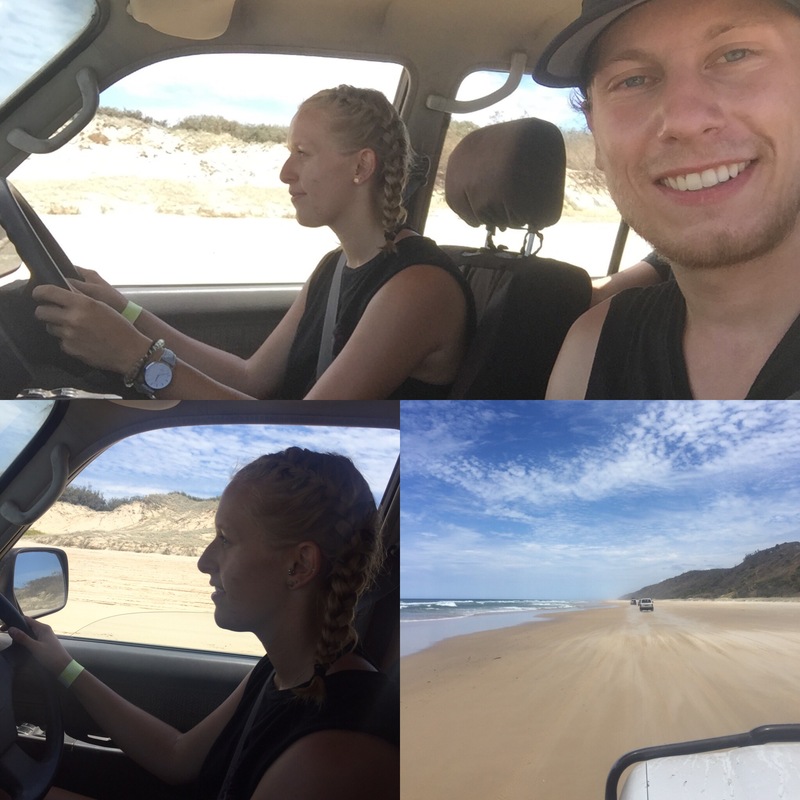 The beach driving was challenging in the soft sand and took some getting used to but Niall was very good at it and handled it like a pro. Niall also drove across firmer sand on the beach where the main challenge then was to avoid any waves coming in as it would mean you lost control of the car if you drove across the water. After stopping for some lunch, we drove on a really hard route of off-road sand track to our first destination into the middle of the island. At first a Swedish girl in our car called Carrin was driving and was doing a good job but then got us stuck. It was something that could have happened to anyone and had happened to another car already but we weren’t able to get ourselves unstuck. We were car 4 so the last car in the convoy so our guide Paul had to run back to get us unstuck and then he asked if Niall would continue driving because it was a challenging track and we needed to stick to time. Niall happily obliged and got to drive us the rest of the day which he really enjoyed as it was all off road and challenging with lots of bumps that threw us around the car which was really funny. 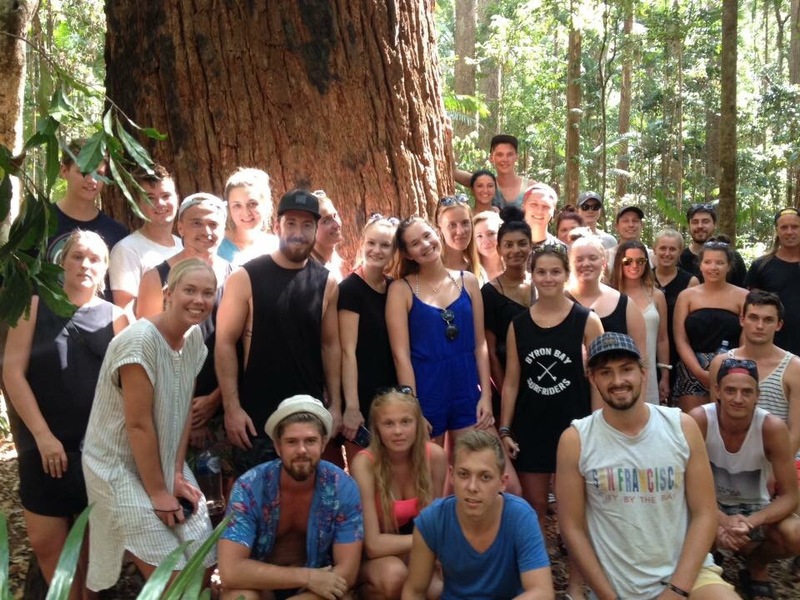 Our first stop was into the rainforest which was full of Satanay trees (apparently there aren’t many places that have them in the world) and we were told about the site and how it was an aboriginal site for the Boochala people which was one of the main tribes on the island. 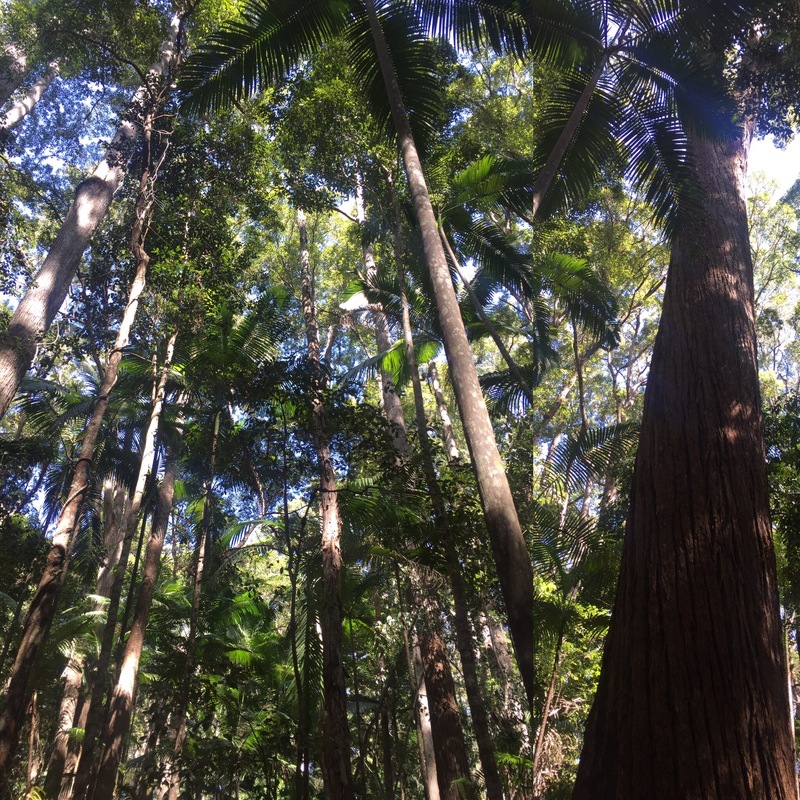 It was cool going into the rainforest because this is one of the only islands in the word that grows a forest on sand. 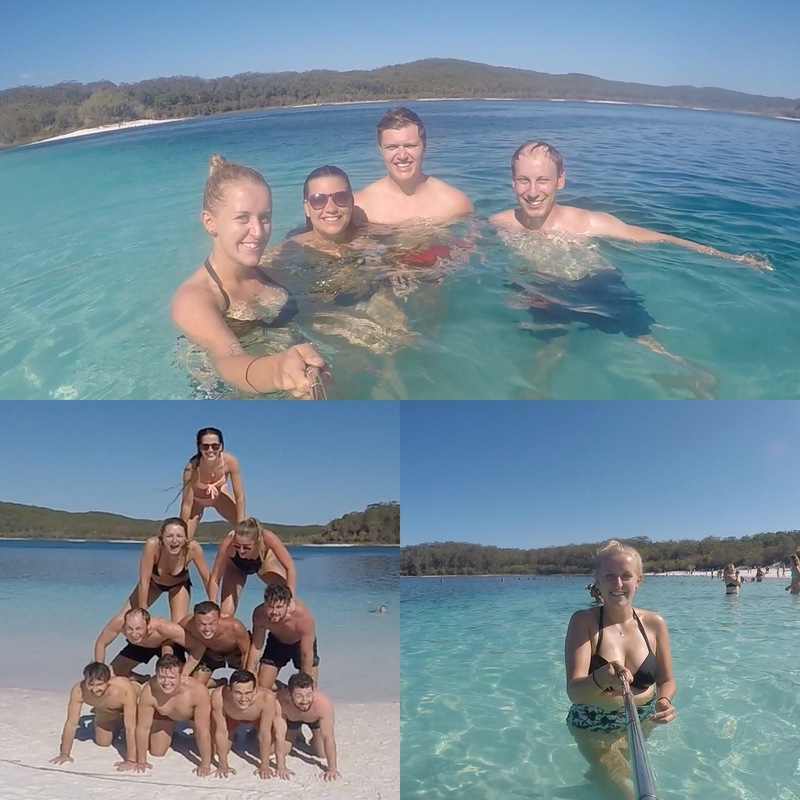 Our next stop was probably one of the highlights of everyone’s Fraser Island adventure – Lake McKenzie (or Booloongura in Aborigini which means waters of wisdom). 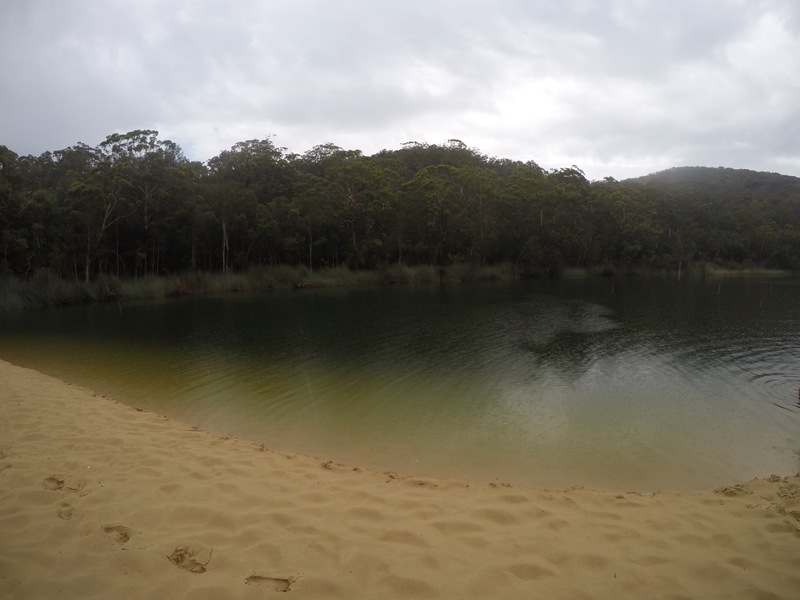 It is a fresh water lake somewhere in middle of the forest on the island and is surrounded by silica sand which is the purest form of sand in the world (and incurs huge fines if you steal any because it’s so expensive!) 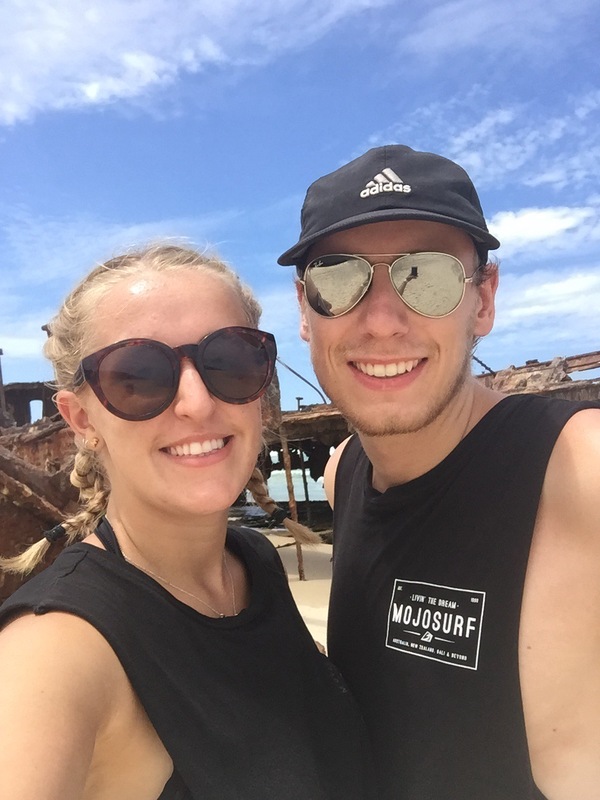 Apparently if you were to put a blow torch to the sand it would turn to glass which is pretty cool and it’s great for exfoliating your body and face (which of course we tried including getting our feet in a bit of a nicer condition!) One other thing we were told about the sand was that you could brush your teeth with it which everyone did. Unlike other sand which would be disgusting in your mouth the sand was fine and was meant to polish and whiten your teeth. The lake is stunning and is made of rain water so is very clear (you’ll see from the photos of us in the water) and fresh. 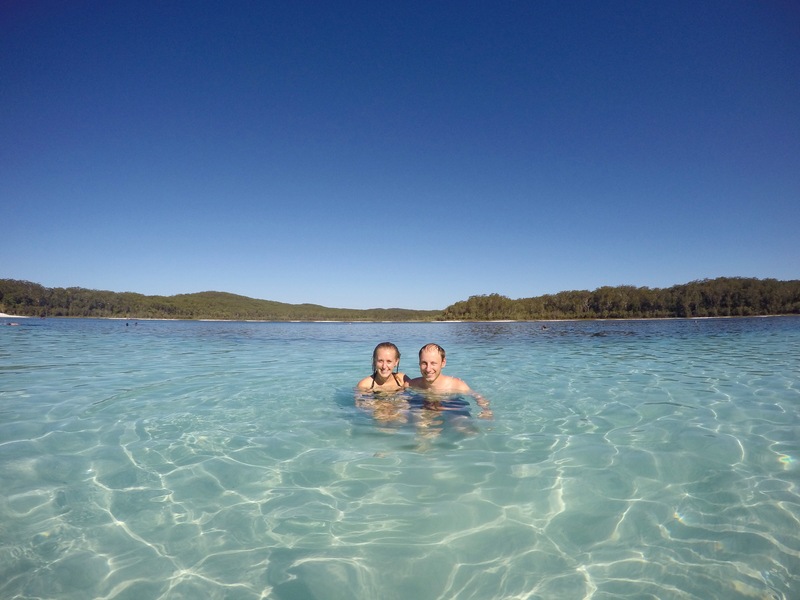 There aren’t that many fresh water lakes in the world (apparently around 75) and 45 of those lakes are on Fraser Island. 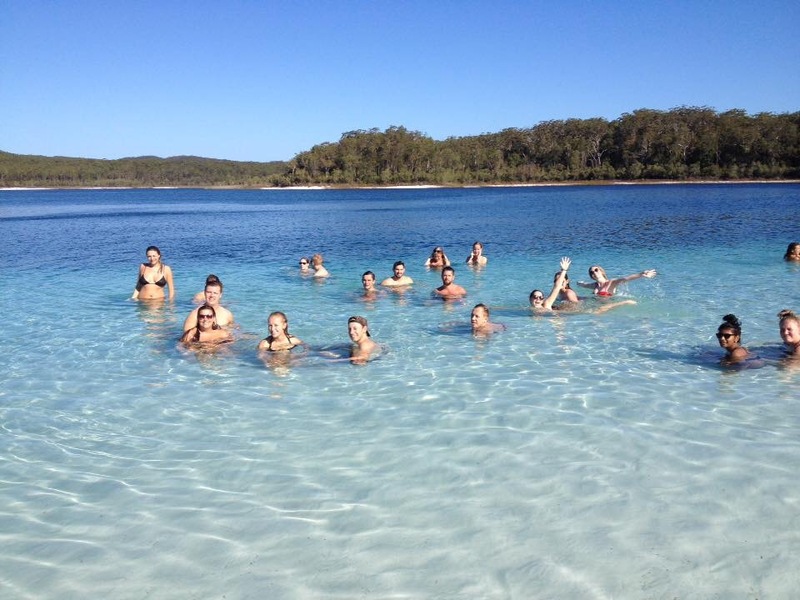 You aren’t able to swim in the sea around Fraser Island as many sharks go to breed there but it was better swimming in such fresh water. A lot of us from the tour chilled together at the lake and our guide also sat with us to get to know us all and also took photos of us all throughout the trip which he shared on Facebook for us to have which was a lovely touch! 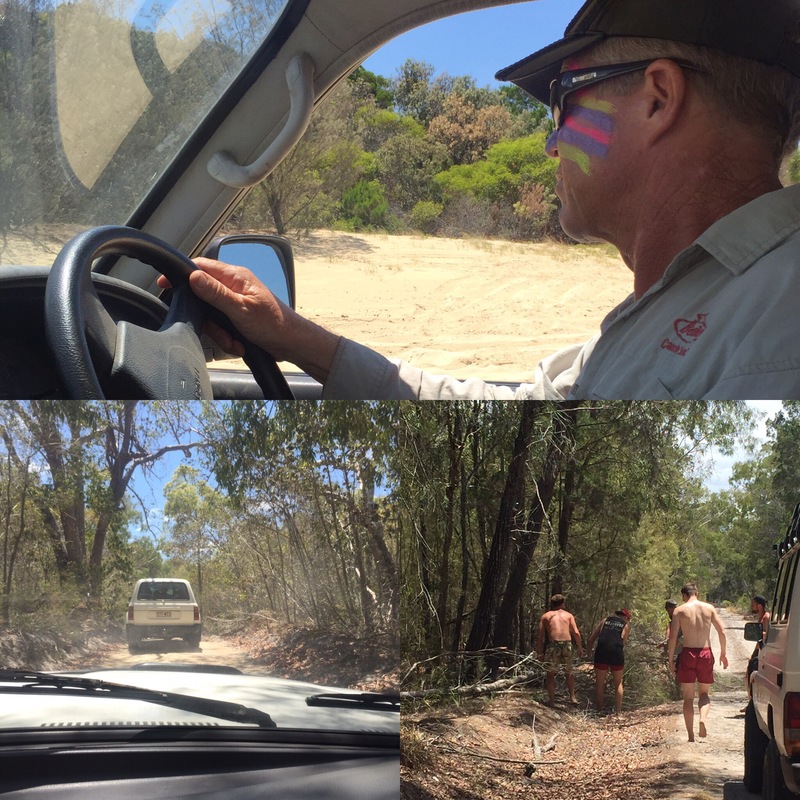 After another bumpy, fun journey back through hard tracks (Niall was made to drive again – which was great for him!) we got to where we would be staying for the next two nights. We had opted to stay in tipis over the dorms and so had some other people in our car so me, Niall, George, Bronte and another girl in car 2 called Daisy all got a tipi together. 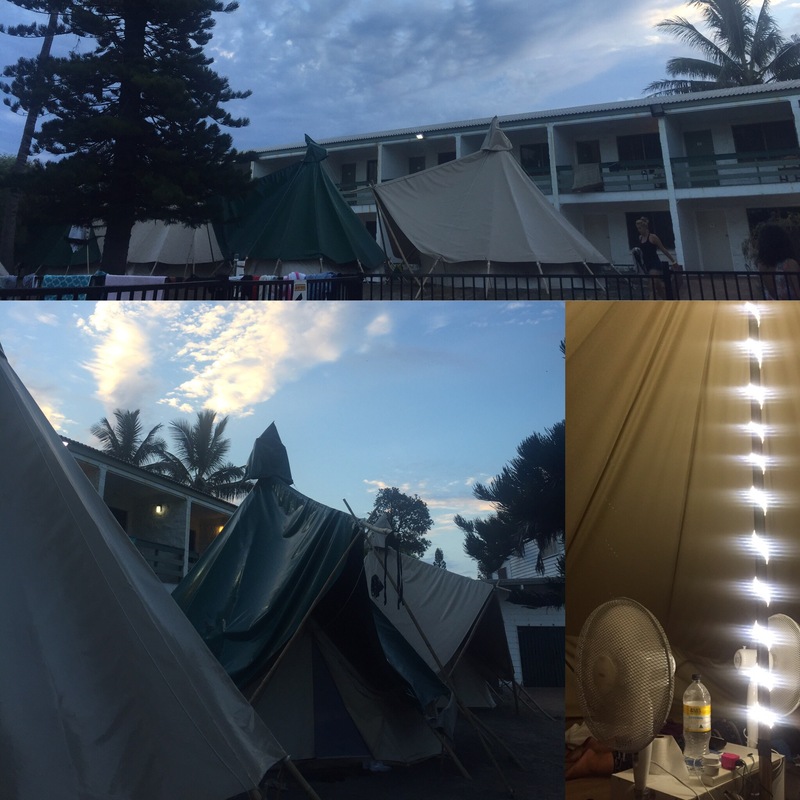 The tipis were great with padded matts, fans, fairy lights up the centre and plugs so you could charge your phones and cameras. We all got on really well in our tipi too so it was really nice to be staying there! For tea Niall got a big steak, potatoes, veg and gravy and I was the only vegetarian there that night so I had veggie burgers instead of the steak. Another group was also there at the same time and they organised a beach party as it was their last night. The guide drove the car down to the beach so that we could play music and we all went down and drank and partied on the beach which was really fun. It was also amazing seeing all of the stars lighting up the sky seeing as there was no light pollution on the island. The 19th February was our first full day on the island and we were woken early to get some breakfast and get ourselves ready for the day ahead. None of us really knew what we would be seeing that day but the weather was great and we knew it involved swimming so we were all excited. 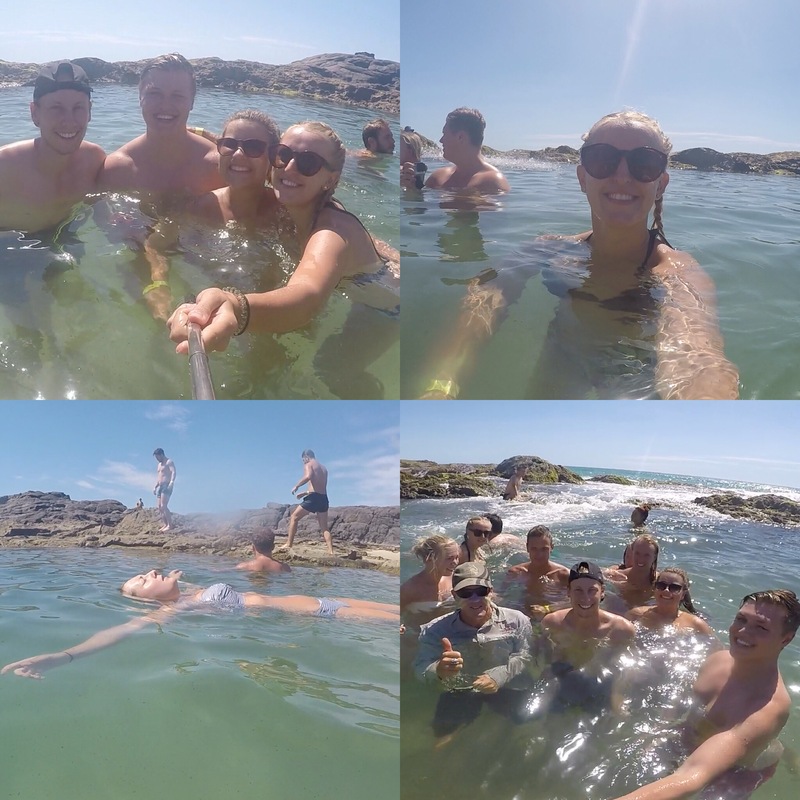 After driving along the beach to the other end of the island, we reached Champagne Pools which was the only sea water we’d be swimming in on the island. 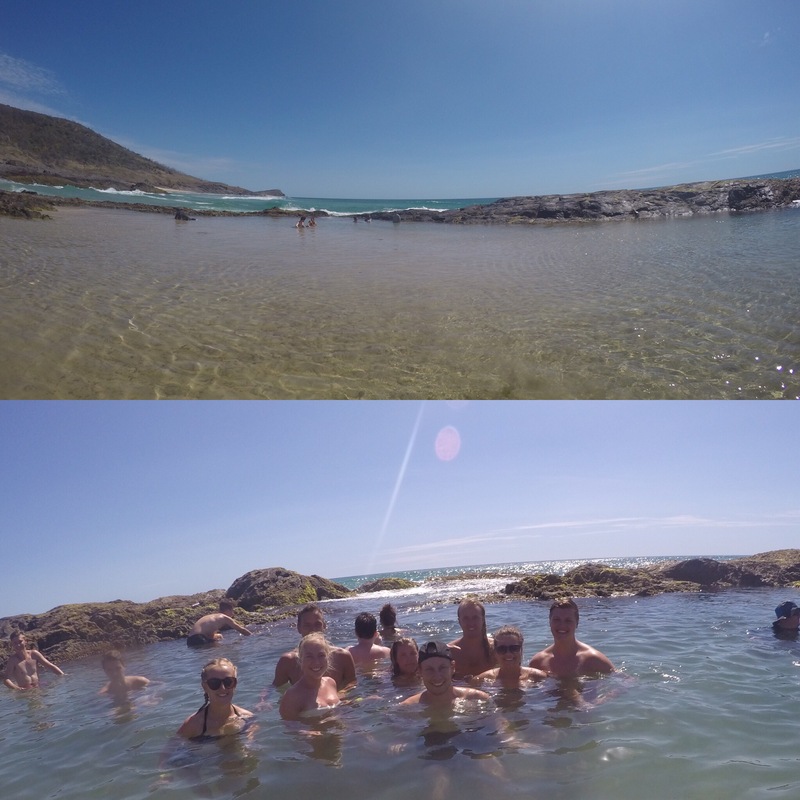 The rock pools are a big raised pool from the sea edge and are formed from the waves crashing over into the pools. The water was really calm, contrasting the crashing waves brilliantly, and the water was a light turquoise with little fish swimming in it. 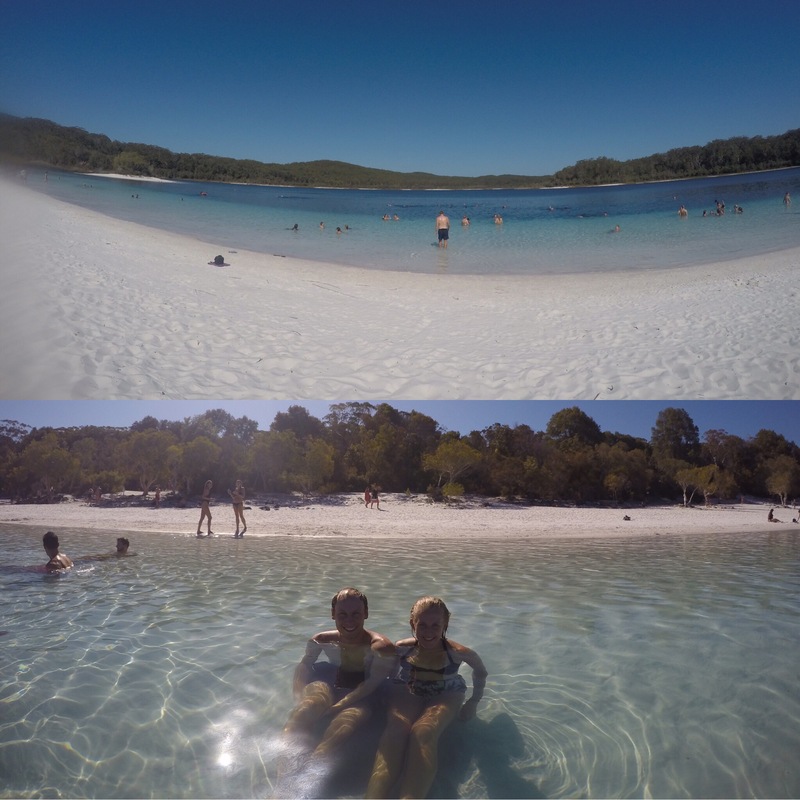 We got to spend quite a bit of time here and so paddled and sunbathed which was nice after an early start. Indian Head was our next stop on the island and was said to be where we had the best chance to see some sharks. The view point gave us stunning views of the coastline of the island and out onto deep turquoise sea. 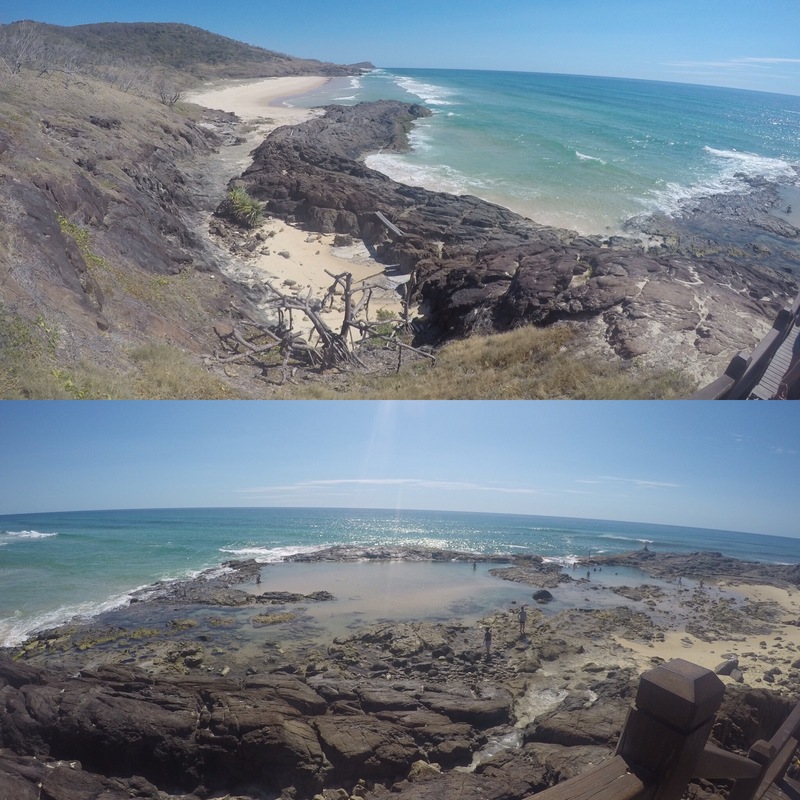 Apparently the aboriginals on the island would use this as a meeting place to learn about their rules and laws as well as sentence and punish any wrong doers (the ultimate punishment was being thrown off a cliff!). 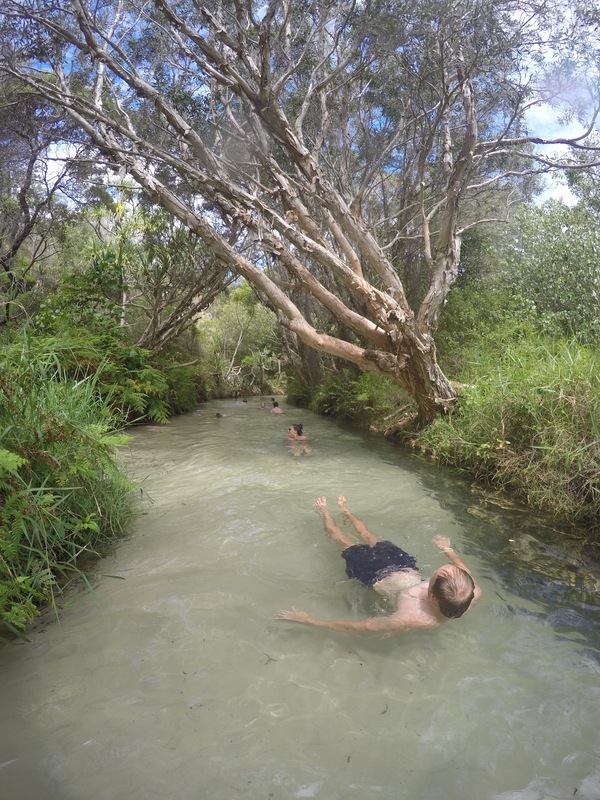 They believed that one of the god’s helpers was turned into Fraser Island and that the lakes such as Lake McKenzie were her looking out to the heavens and that the streams on the island were her heart rate – apparently the stream has a pulse running through it every 4 seconds. 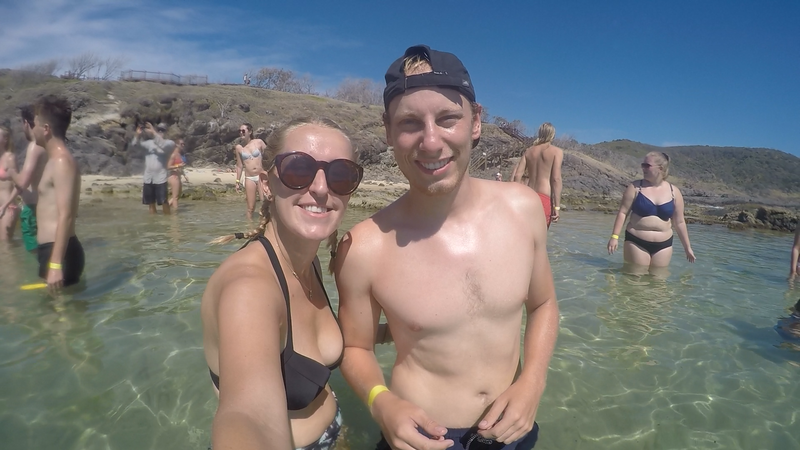 Unfortunately we didn’t see any sharks but we did see some huge sting rays and some turtles so it wasn’t a complete disappointment! We stopped at Cathedral Beach for lunch and I got to drive which was fun. 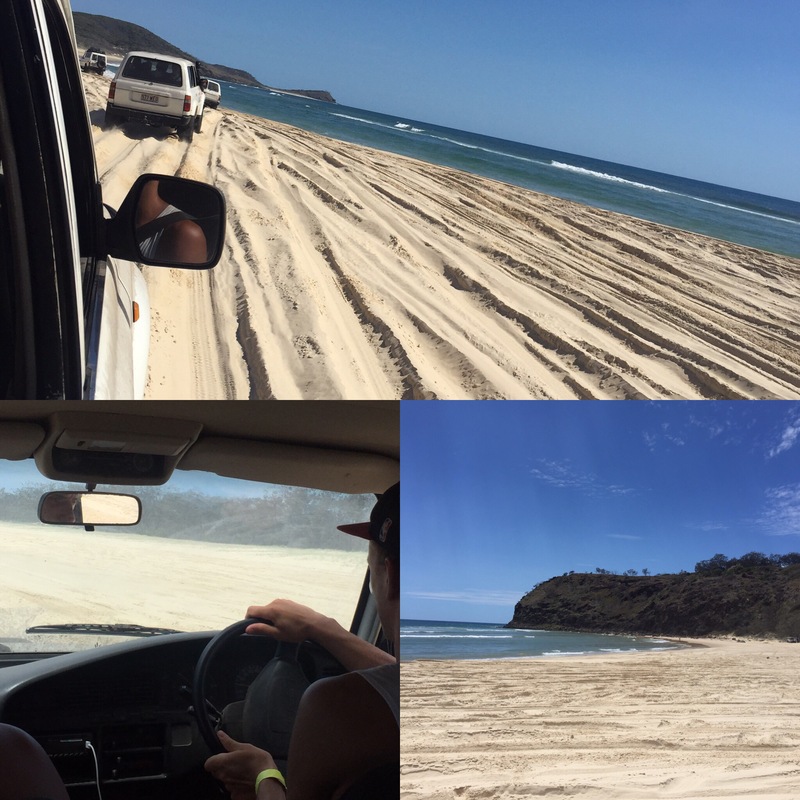 It was cool driving along the beach and to get to our lunch spot I had to do a small patch of off roading which was really fun! 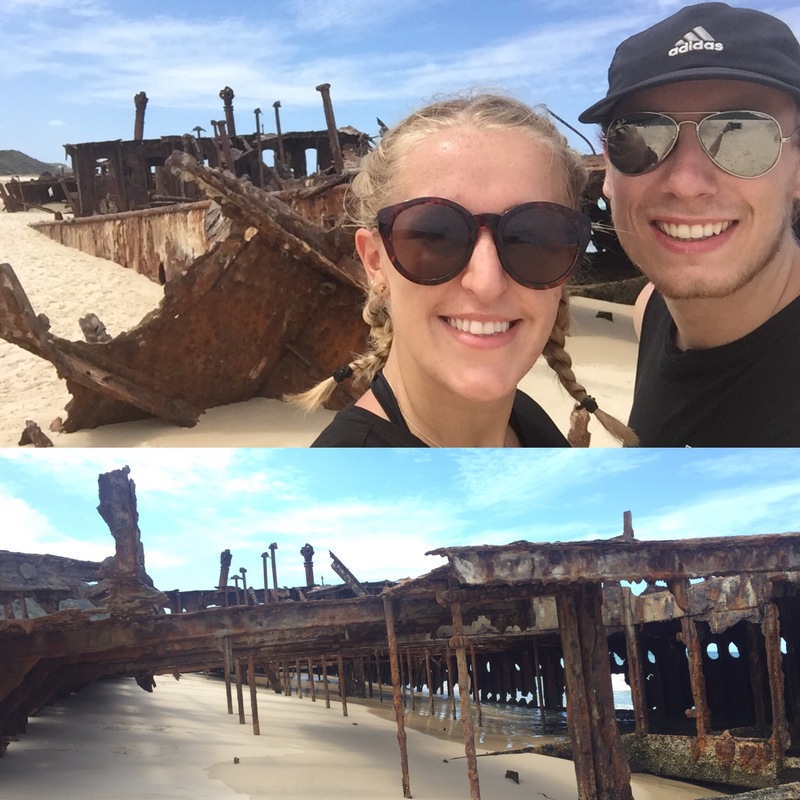 After lunch we went to the Maheno Shipwreck. When it was in operation it was the fastest ship of its time and was used as a cruise ship. When the 1st World War started, it joined the war effort to become a hospital ship before turning back into a cruise ship once the war was over. After it finished as a cruise ship it was bought by a Japanese company. 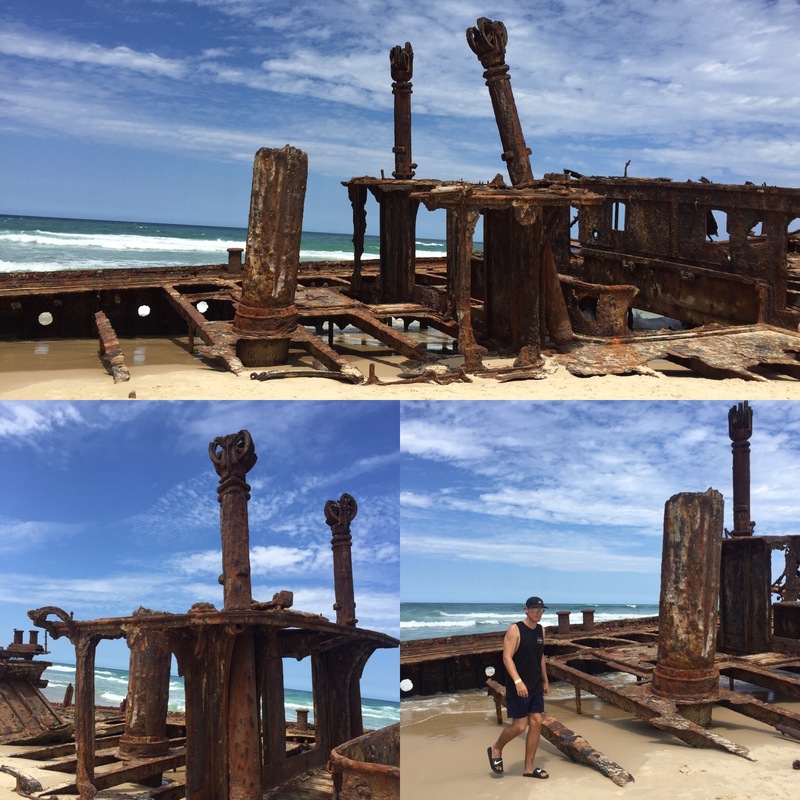 As it was being towed back to Japan it was caught in a cyclone that snapped the tow rope and became stranded on the shore of Fraser Island – gutted for the Japanese company who lost their boat! 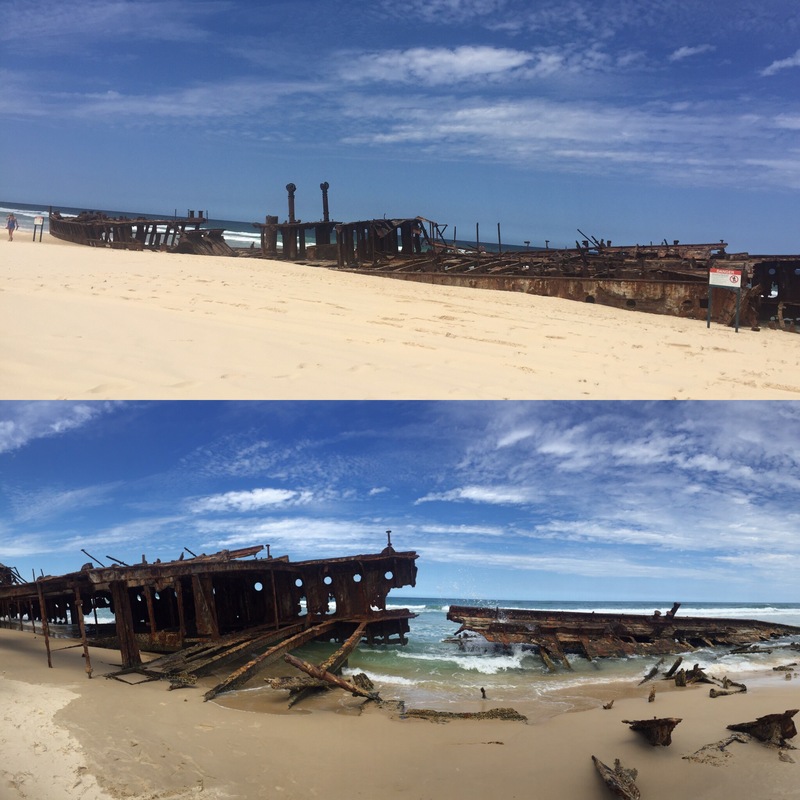 The boat was actually in perfect condition when it was stranded and remained that way for years until the 2nd World War began when Fraser Island was used as a weapons base and the boat was bombed in a test by the Australian Army. The wreck is quite big and, remarkably, is only a small fraction of the boat with 50m of the boat being under the sand! 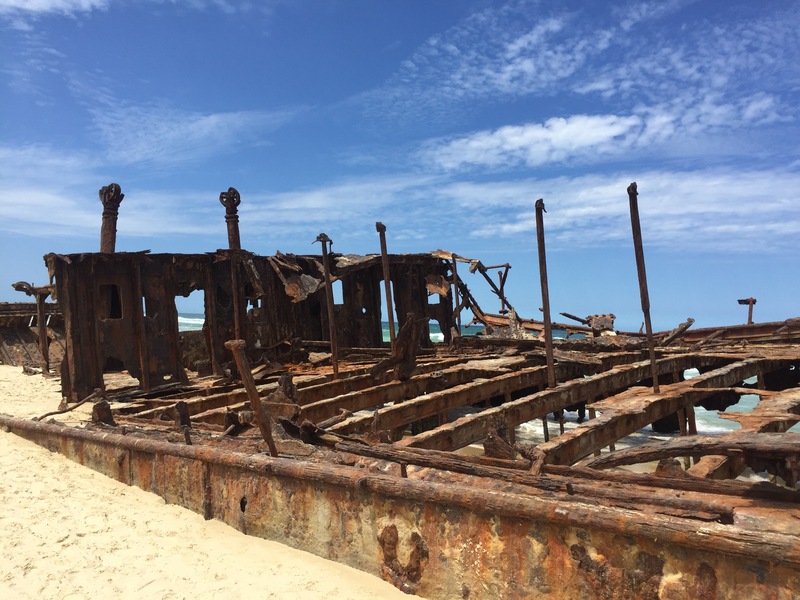 We got to have a good look at the shipwreck – it was nice because we weren’t rushed through all of the stops on the island – and then headed to Eli Creek which was the last stop of the day. 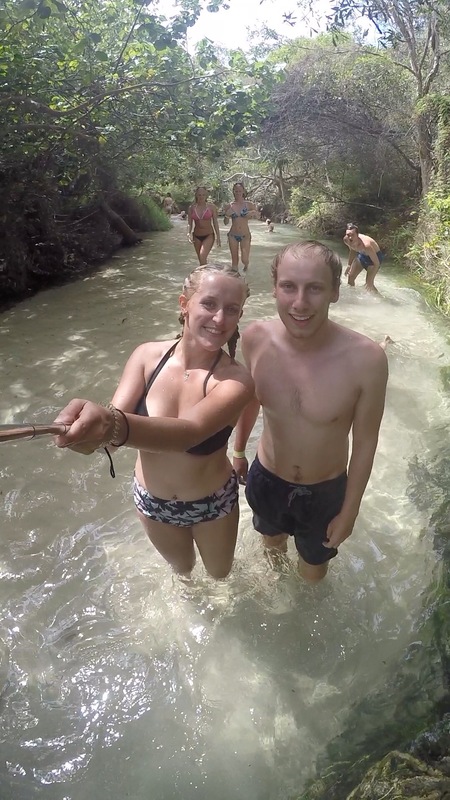 This place was really cool and was, in effect, a natural lazy river. 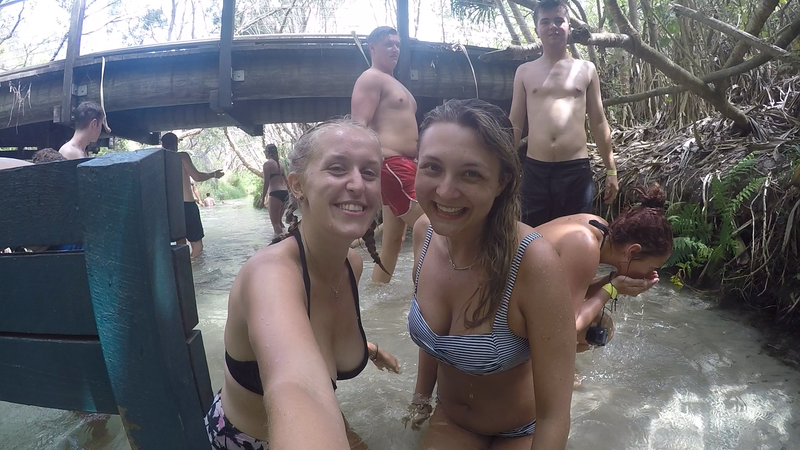 The creek was fresh water and we all went to the top of the stream and had a drink – it really was very good water! 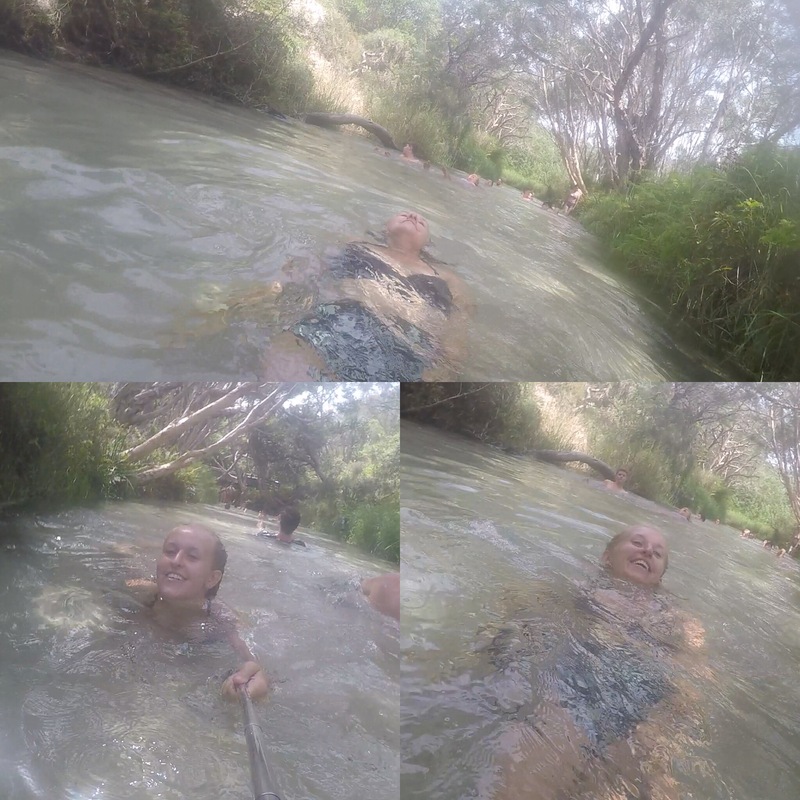 After that you could float all the way down the creek which was really fun and you actually went a lot faster than you’d think! We also got to sunbathe here and our guide brought us biscuits (all of us loved that!) We went up and down the lazy river loads of times and some people had inflatables which would have been fun to have a go on.That evening we had pasta and garlic bread (loads more vegetarians that night) and then played beer pong and chilled the rest of the night as we were all pretty tired! It was a really fun day, doing loads of things and seeing some great sights – couldn’t fault a bit of it! 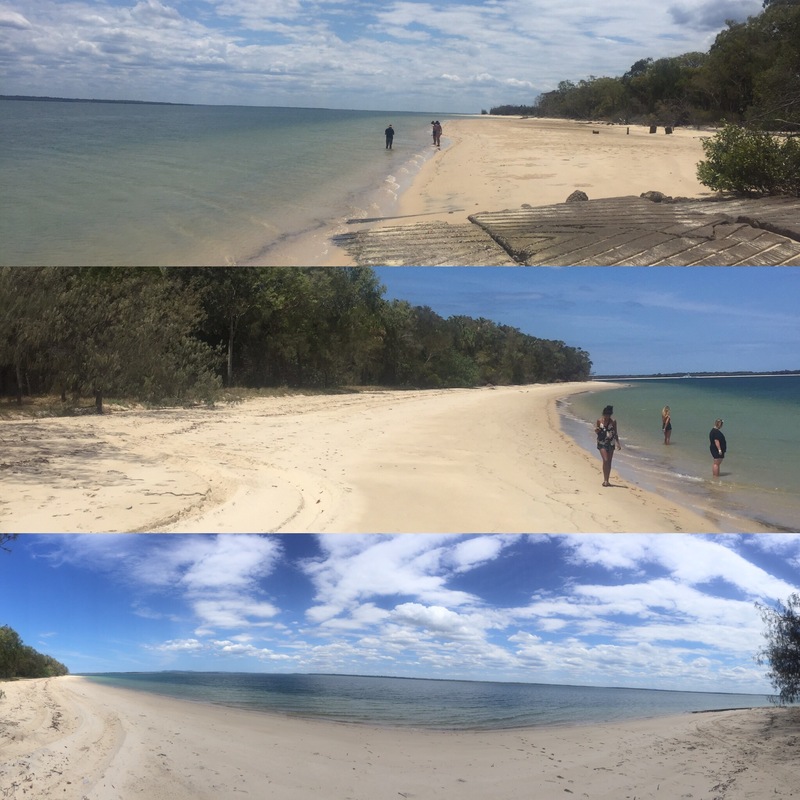 Our final day started with us having to pack up all of our things and pack up the cars because we would be leaving after our final destination to get the ferry back to Rainbow Beach and then the bus back to Noosa. It had rained really heavily in the night and our tipi had flooded a little bit causing George and Daisy to get very wet – me, Niall and Bronte had been on the other side of the tipi so stayed bone dry! Luckily it had mainly been their sheets so not their things or electronics but we knew some other people in another tipi who had to get moved as their tipi had completely flooded! 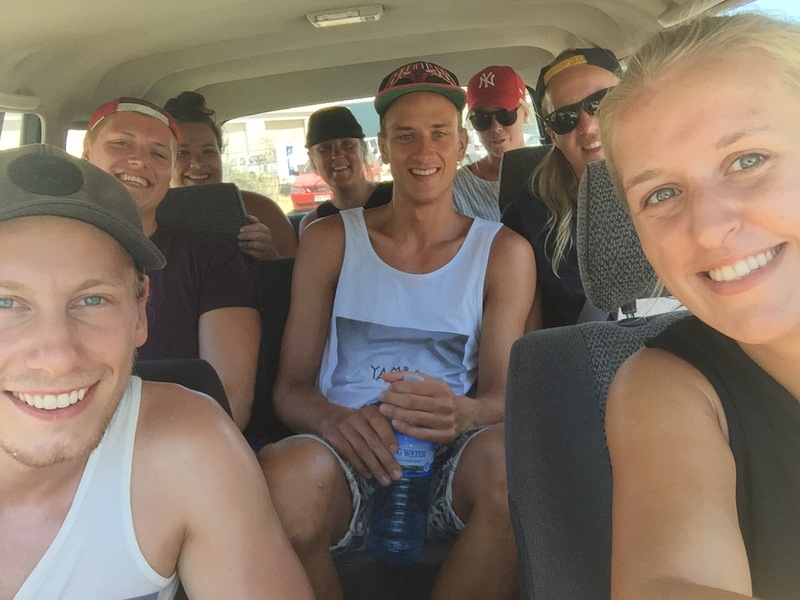 We were all set at 8am to head to Lake Wabby which is the deepest lake on Fraser Island. 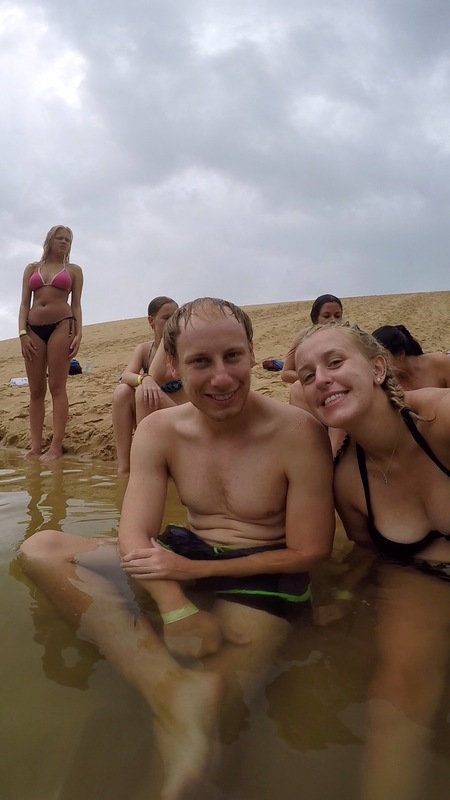 To get to the lake, you drive down the beach and then trek through the forest over a hill to reach giant sand dunes and the lake itself. As we were about to start walking it began to rain which actually made the walk a lot easier as it was sand underfoot so the ground was firmer as well as it being a lot cooler. 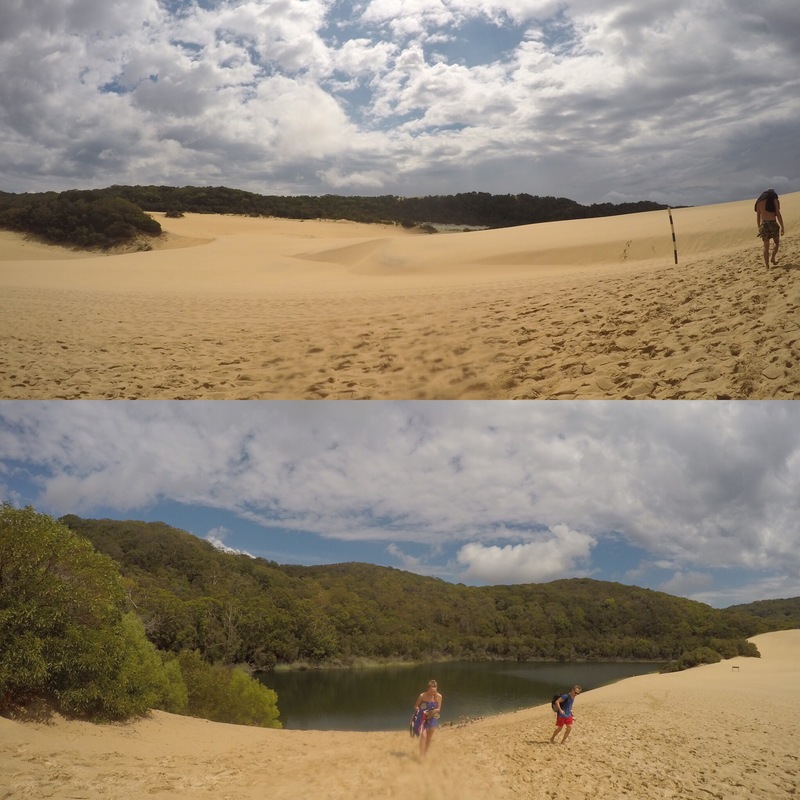 The walk took around 45 minutes and was worth it as the lake was really pretty surrounded by the vast sand dunes on one side and then the tea trees along the other. A really cool thing about the lake is that it had tiny fish in that would eat the dead skin from your body (like those ones that used to be in shopping centres a couple of years ago). 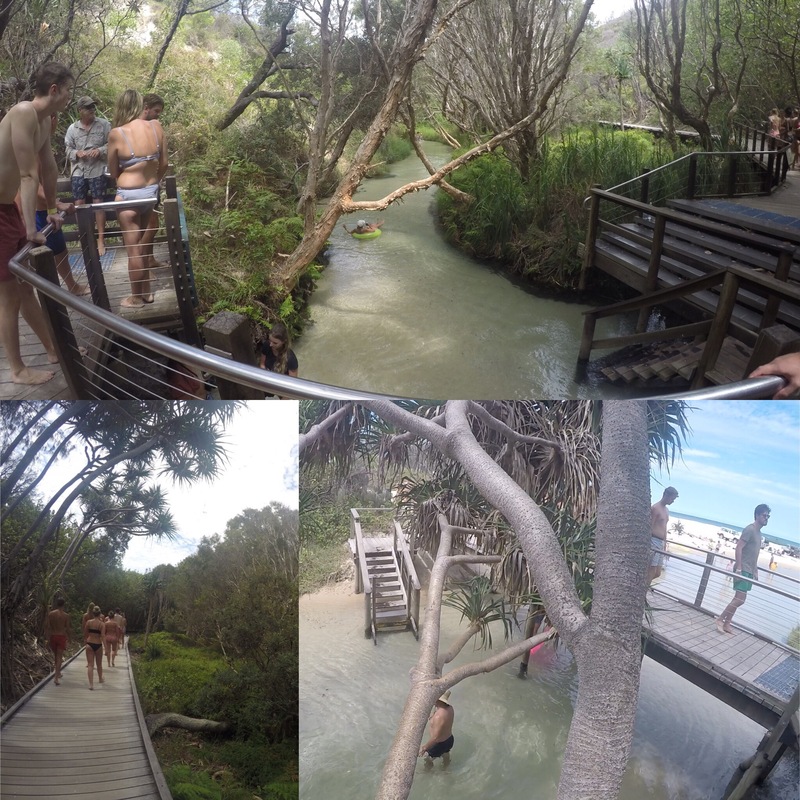 We had a couple of hours in the lake and got to smell some of the tea tree leaves that surrounded the lake. It was a really nice way to end our time in Fraser. After our trek back to the lake I got to drive again along the beach which I loved. 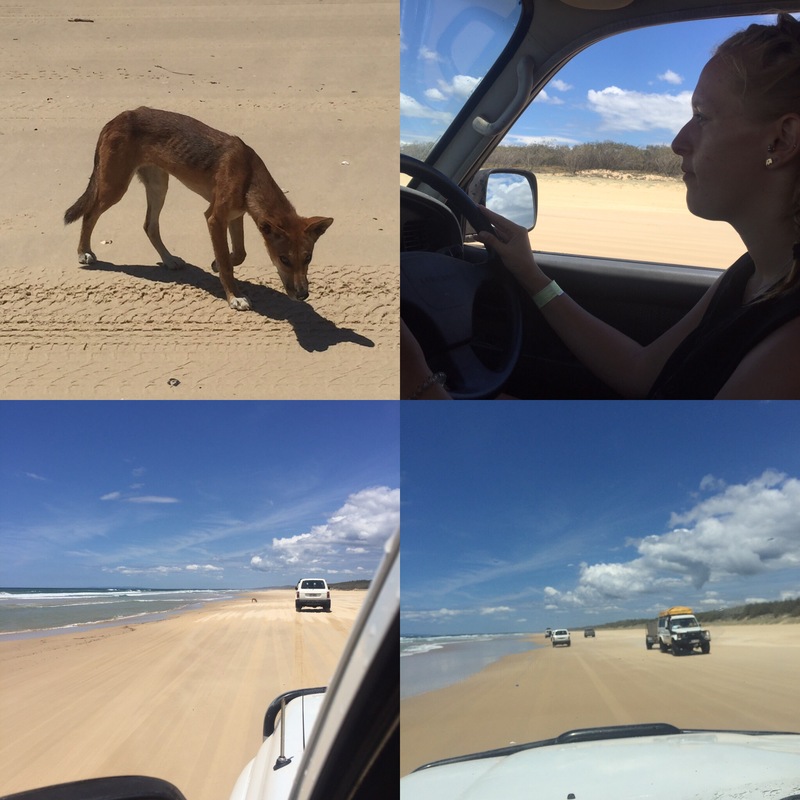 We hadn’t seen any dingoes yet and then someone from one of the other cars in front spotted one and shouted it over the car radios. Our guide let us all stop to see it and a man who was fishing was trying to get it to leave him alone. Further along the beach we then saw another one which was a bit closer to the car and we were all so happy as we had been really worried we wouldn’t see any at all. 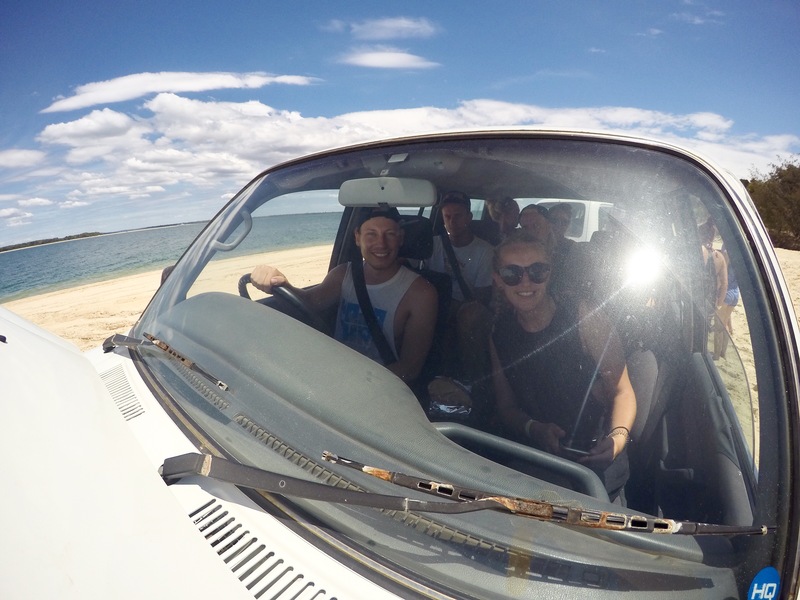 After that, we swapped drivers and Niall drove again. There was lots of soft sand and car 2 in front got very stuck and had to be pushed out. At the same time, our car alarm started going off because it was overheating. It was easily fixed but did give our guide a lot to sort out all at once! As if being stuck wasn’t enough for one day, we were driving a long and a tree had fallen into the middle of the road which meant all the lads got out to move it out of the way. 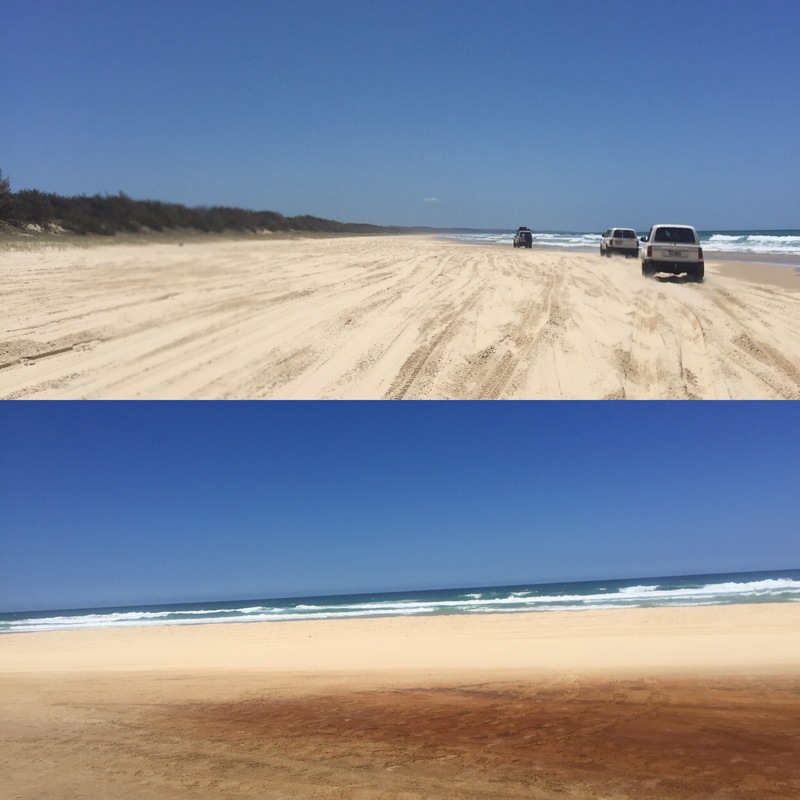 The barge wasn’t at Fraser Island yet so we went to a really pretty clearing for lunch before we got the barge back to Rainbow Beach, filled the cars with petrol and got back onto the coach to go back to our hostel in Noosa. 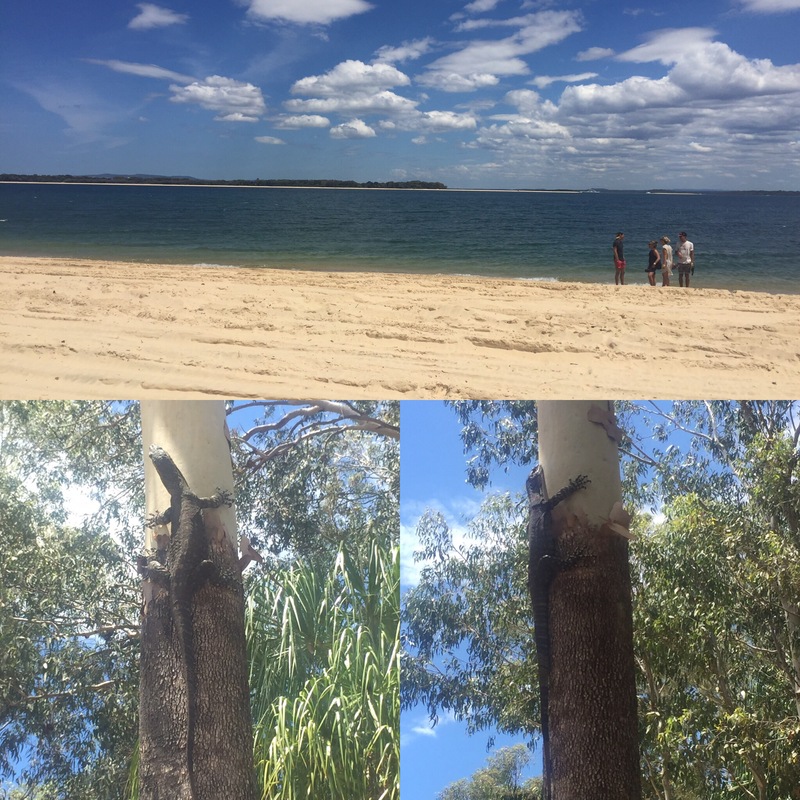 We had two nights in Noosa after Fraser Island which allowed us to catch up on some sleep and chill with our new friends as well as catching up with some of our other friends that we had met along the way in our east coast journey. 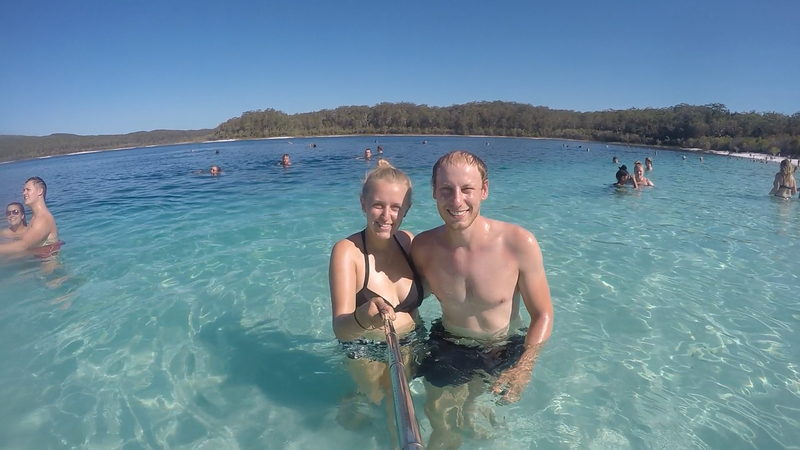 Our Fraser Island trip has definitely been one of the highlights of our east coast trip and probably of all of Australia. 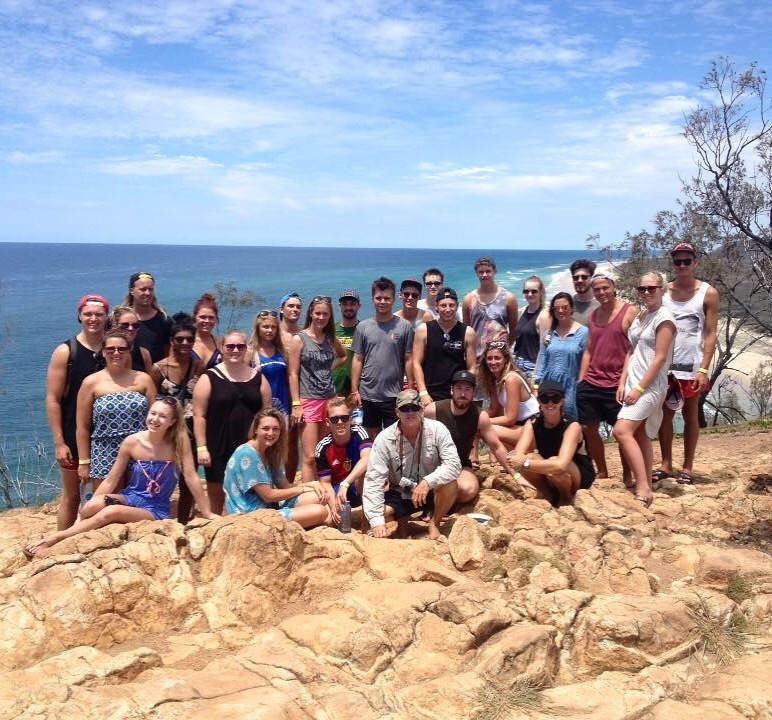 We had a great group of people that all got on really well, had good weather and saw some beautiful things. 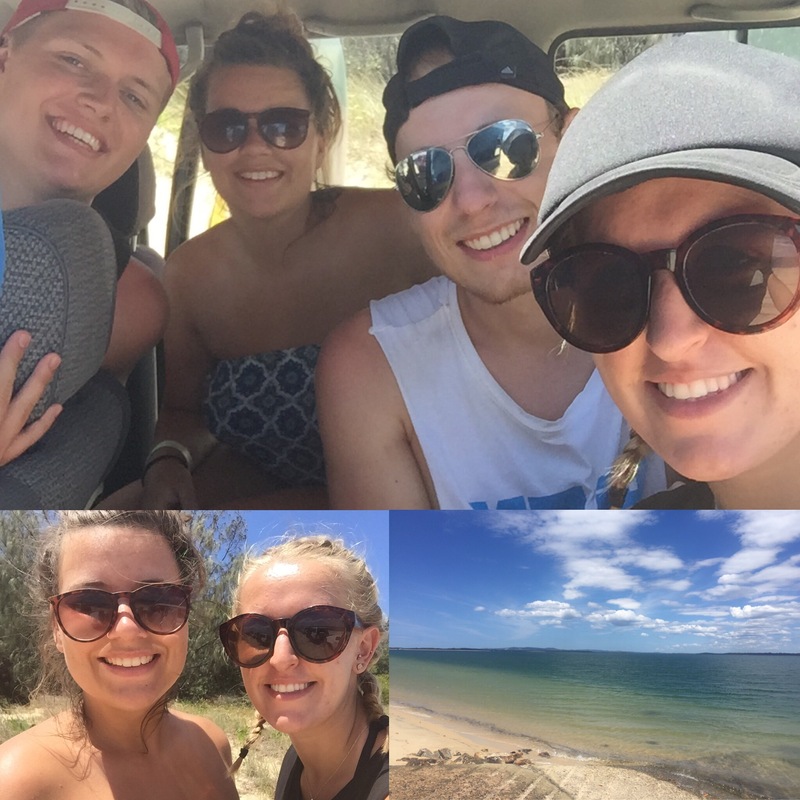 I am so glad we did it and definitely recommend doing it for anyone who will be travelling the east coast!